You’ve heard of “niche” marketing, right? How about “target” marketing? These aren’t just buzzwords. They’re real techniques that deliver real results, and FORUM magazine is the perfect place to put them into practice. 74 percent of business professionals who regularly read custom publications think they are a more effective vehicle for companies to talk about products or services than other forms of advertising. 30 percent of business professionals who regularly read custom publications say they have purchased a product or service highlighted in one. Even 72 percent of business professionals who don’t regularly read them say custom publications are a better vehicle for companies to inform them about products and services than other ad mediums. Chicagoland is home to more than 1,600 Chicago associations and nonprofits, which serve 27 million individual members, 250,000 corporate members and 9 million donors worldwide. Of the total $10.3 billion in annual Chicagoland expenditures, approximately $947 million is spent annually on printing, information tech services, web design, accounting and legal fees. More than half of Chicagoland associations fully or partially outsource these vital services. Chicagoland associations report $2.6 billion in annual spending on conferences, conventions, and meetings. If you’ve ever tried to cold call them, you know exactly how difficult it is to get access to prospective customers. If you show up at their office, you probably won’t make it past the receptionist; if you e-mail them, you probably won’t make it past the delete key; and if you call them, you probably won’t make it past their voice mail. Even if you manage to secure a meeting, you’re more likely to be pitching associates than executives. Because “access” is so difficult, most sales calls end up being a waste of valuable time and money. FORUM isn’t most sales calls, however. It’s the ultimate sales call. While your sales rep is stuck at the receptionist’s desk, FORUM sails past it and lands directly on your prospect’s desk. From there, it’s read and passed around from C-level association executive to C-level association executive. By the time your sales rep’s made his fifth unreturned phone call, FORUM’s been in the hands of the association’s COO, its CFO, each of its department heads and even its CEO — all of whom have serious purchasing power. 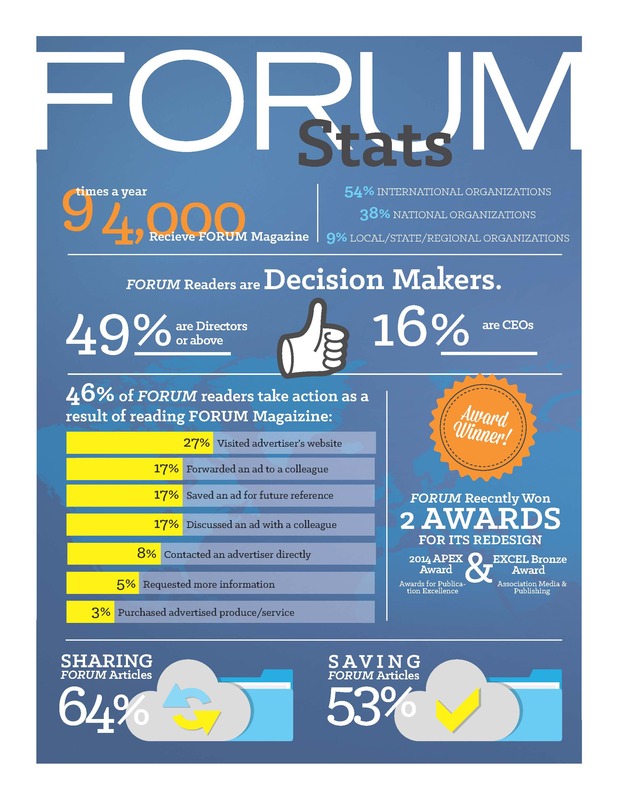 And because it’s published nine times per year, FORUM will make the rounds again next month. The best part: You don’t have to pay it a commission.